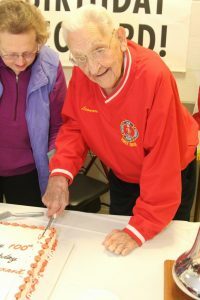 The Easton Volunteers recently hosted a 100th Birthday Party for Leonard Rieck, our oldest living member. Born on November 27, 1917, Leonard was born during the 1st World War, fought in the 2nd World War, his eyes have seen the landing on Normandy and the landing on the Moon and so many more things along the way. 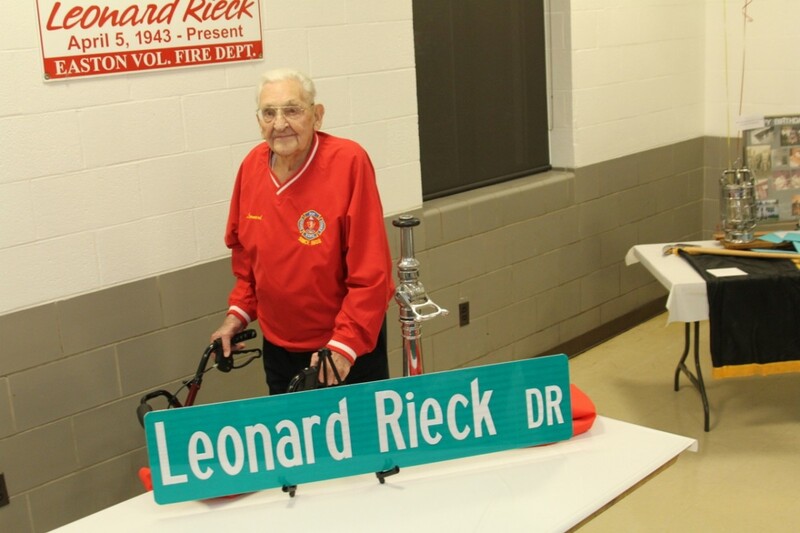 Mr. Rieck is an inspiration to all members, young and old, and the Easton Volunteer Fire Department wanted to celebrate his Century Mark in a fitting way. 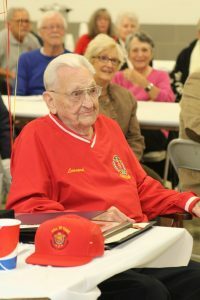 A party was held on Saturday, November 18, 2017 celebrating his 100th birthday, with more that 100 in attendance, including representatives from the Maryland Senate and House of Delegates, Comptrollers Office, Town of Easton, Easton Police, Maryland State Firemen’s Association, Eastern Shore Firemen’s Association and the Talbot County Fire & Rescue Association. Leonard was presented with numerous citations and awards marking his lifetime of achievements. But one problem still remained. How do you give a man something, when he has everything he has ever wanted? You give him something that will last an eternity. 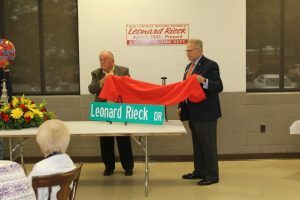 The Easton Volunteer Fire Department Board of Trustees approached the Town of Easton about renaming Aurora Park Drive, the street where the Easton Volunteer Fire Department has been located since 1962 (Leonard was on the Building Committee), in honor of Mr. Rieck. It is with great thanks to the Town of Easton Mayor Robert Willey and all of the Council Members that the Easton Volunteer Fire Department address will be forever known as 315 LEONARD RIECK DRIVE. Happy 100th Birthday Leonard!!!! WE Love You!! !